The anti-corruption strategy adopted in January of the previous year provides the strategic framework and sets out the basic principles and objectives, while the action plan contains specific measures to be implemented by the Federal Chancellery and the federal ministries over the next two years. At various events held last year, such as the Austrian Anti-Corruption Day organized by the Austrian Federal Bureau of Anti-Corruption (BAK), organizations and institutions from all sectors were invited to participate in the preparation of the action plan in order to work together in a national alliance against corruption. 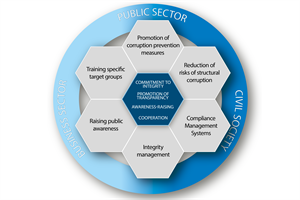 In accordance with the structure of the NACS, the action plan, which was drawn up in close cooperation between the BAK and other responsible departments and was agreed by the Co-ordinating Body on Combating Corruption, is divided into the sections "Prevention” and "Law Enforcement”. In the "Prevention” section six sub-categories were created to provide a better overview and define priorities. Examples are the promotion of integrity and compliance through, inter alia, the Austria-wide "Network of Integrity Officers", as well as the development, evaluation and revision of department-specific codes of conduct and of the code of conduct "The RESPONSibility rests with me”, which is applicable across all federal ministries and territorial authorities. The section also includes risk analysis and risk management, awareness-raising and (advanced) training in the areas of compliance, integrity and corruption prevention. The aim of this decision taken in the 42nd session of the Council of Ministers is to bindingly implement the measures listed in the action plan or to initiate corresponding implementation steps in the period from 2019 to 2020. In order to periodically supplement and update the action plan, it was conceived as a "living document”.